The billboards started popping up everywhere. In New York and Los Angeles. In Toronto, Rome and Athens. In Berlin, Amsterdam, Paris and London. In Hong Kong and Tokyo. Happy Christmas from John & Yoko. 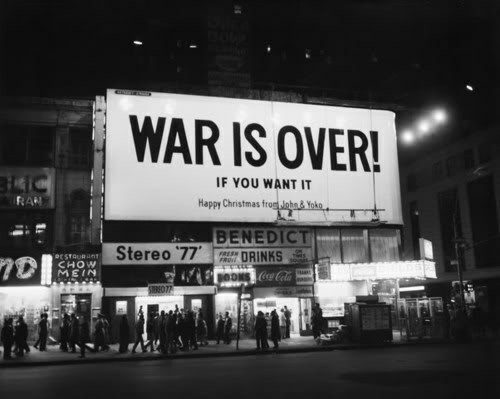 The message, of course, from John Lennon and Yoko Ono, the date December 15, 1969, a campaign devised to promote their anti-war agenda at a time when conflict raged in Vietnam. During a subsequent interview, one reporter asked Lennon how much the billboards had cost to erect. Founded on John and Yoko’s guiding principles – harmony, togetherness, love and peace – the campaign contested that, if everyone on Earth could just connect, there would be no need for wars. It is a notion to embrace, one that still rings true today, a little over four decades on. That the conflict in Iraq lasted so long shows that the word still needs to be spread. That in mind, in New York City, Yoko Ono continues to fight for a peace that remains elusive. To quote Yoko Ono, ‘We say it in so many ways, but we are one’. To use terms just a little different, we are all connected. Back to the 1960s and, two years after unveiling their billboards, John and Yoko once again began to spread their message, this time using music, a language that all understand, a method universal. Hearing it on the radio these days, the message behind Happy Xmas (War is Over) can get a little lost, but it is important to remember that this is more than just another Christmas song. For that reason, we’d like to share the film made to accompany John and Yoko’s music, albeit with a warning. The warning is this, that the following is, in parts, harrowing, the images often upsetting. Sometimes, of course, one needs to be exposed to things distressing to underline what it is that we’re striving for: Peace. Love. Togetherness. Connection. No-one said it would be easy, after all. It might be tough to watch, but it’s worth it, for this film provides compelling evidence. Evidence that, deep down, no matter our backgrounds or beliefs, we all want the same things. To quote John Lennon, ‘Peace in our minds, peace on Earth, peace at work, peace at home, peace in the world … trying to make the next day a bit better … fighting the good fight … No violence, no frustration, no fear’. It’s inspirational stuff and, although we might be coming at it from a different angle, there’s no question that, here in Saunderstown, we’re working towards the same goals. Understanding. Compassion. Love and peace. It’s about putting differences aside and working together, as John Lennon and Yoko Ono set out to do in the 1960s, as we are doing in 2011 and on into the New Year. It’s a common goal that binds us all together, one that underpins our efforts and inspires our OMs.